"WN-G54/CF" is, IEEE802.11g / b wireless LAN standard that supports CF type wireless LAN card adapter. 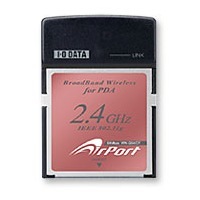 PDA-compatible high-speed wireless communication is possible anywhere easily. WEP (128/64bit), WPA-PSK (TKIP) encryption methods are supported.